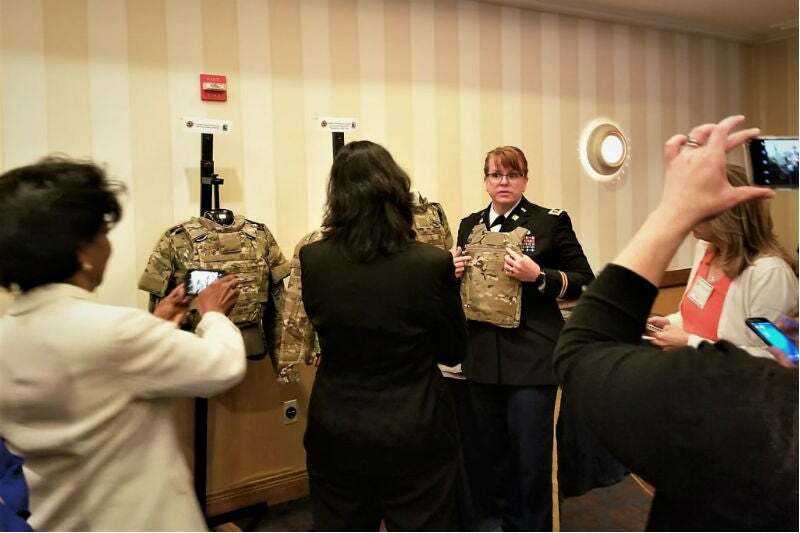 Lt Col Ginger Whitehead demonstrates the new Soldier Protection System, which in its lightest form can be worn under civilian clothing, while in its full configuration can protect against a myriad of battlefield threats. Credit: PEO Soldier. With more women now entering combat roles, a key driver for the new SPS has been to ensure that the items that make up the system are also comfortable for females. Credit: US Army. 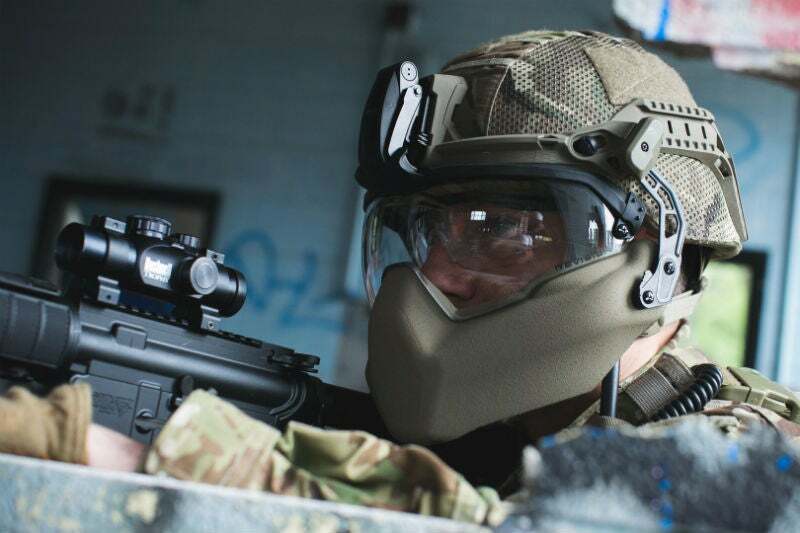 The US Army will field a new Integrated Head Protection System (IHPS) that has an optional mandible guard for lower face protection, usually used by soldiers in urban environments or when outside of hatches in vehicles. Credit: Revision. 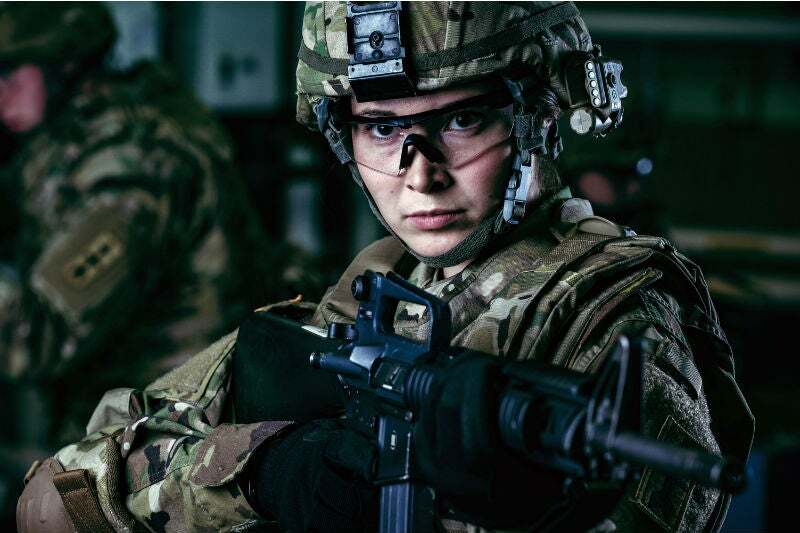 After several years of research and development, the US Army is now in the process of fielding its new Soldier Protection System, a next-generation suite of personal protective equipment that promises to be lighter and more tailorable to meet individual soldiers’ needs. Fielding the new technology ensures that US troops retain their lethality, which is one of the army’s key priorities as it moves forward with several modernisation streams under the new US Army Futures Command. The Soldier Protection System incorporates several sub-systems including a series of lighter weight ballistic plates known as Vital Torso Protection (VTP), Torso and Extremity Protection (TEP) comprising a new modular scalable vest and combat shirt, and a lighter combat helmet known as the Integrated Head Protection System. In addition, soldiers will receive new Transition Combat Eye Protection (TCEP), ballistic protective eyewear that can adapt quickly to light and dark scenarios similar to everyday sunglasses. “Part of the push for this new system was that we were looking for a system that was tailorable, where you can scale it up or you can scale it down depending on your mission, the threats and the terrain,” Whitehead continues. That was not possible on previous soldier protection equipment and Whitehead points out that this was particular important as frontline combat roles are progressively opened up to women. One example of this is replacing the “X-formation” retention strap mechanism with an “H-formation” variant, which greatly improves a female soldier’s comfort when the hair is in a bun. Another element is increasing the size range of ballistic armour plates that a soldier can choose from, especially as smaller soldiers do not need to have larger (and heavier) plates. Whitehead says there will now be three smaller plates, learning lessons from previous “cookie cutter” approaches where one size had to fit all. While these two elements are ultimately unisex, a new ballistic combat shirt (that provides deltoid protection) will be gender specific. For the women’s shirt, there will be a “V-notch” in the back of the collar to accommodate a bun, which is important when a female soldier is lying on her front and looking through her rifle optics. Other changes for the female variant include a shorter sleeve and a wider sweep to prevent the shirt from riding up the body. The new modular scalable vest – which Whitehead notes is the “crown jewel” of the Soldier Protection System – replaces the Improved Outer Tactical Vest (IOTV) which was introduced in the latter years of the Iraq War. The goal was to make the new vest as light as possible, and pushing the envelope in terms of materials and new technologies. The vest can be adapted in such a way that in its lightest form it can be worn under civilian clothing, while the heaviest configuration can protect against a myriad of battlefield threats. For added safety, particularly in terms of removing soldiers from burning vehicles or aircraft, there is a four-point quick release system on the vest. Protective undergarments have also been improved. Previous configurations were generally unpopular with soldiers as they often gave them a “perpetual wedgie”. For the future, the US Army is eyeing emerging technologies and materials including ultra-high-molecular-weight polyethylene composites, with studies looking at its use in protection gear such as helmets. Whitehead notes that the developers are also looking at the use of next-generation Kevlar and even biologically engineered spider silk. The US Army is currently working with Kraig Biocraft Laboratories to develop a strain of genetically engineered silkworms for protective textiles. Ceramics in the soldiers’ hard armour plates still drive much of the weight in protection systems, with Whitehead explaining that the service is constantly looking at new blends of materials that make ceramics lighter, yet harder. This includes boron carbide, one of the hardest materials on earth, as well as silicon carbide. The new modular vest, blast pelvic protector and helmet are now being manufactured in large quantities and fielded to troops being deployed on the frontline, while the advanced VTP still has over a year to go before it enters mass production. “So we are quickly converging and it’s exciting that here in the not too distant future we’re going to be able to equip the entire ensemble to troops that are going into harm’s’ way,” Whitehead concludes. Previous PostReading Between the Lines: The Next Spratly Legal DisputeNext PostRoyal Fleet Auxiliary Ships – An Interesting UK Sovereign Capability Test By Howard Wheeldon, FRAeS, Wheeldon Strategic Advisory Ltd.